The International Passivhaus Open Days offers the public the opportunity to experience Passivhaus buildings. Passivhaus stands as the solid basis for a sustainable energy future, combining superior user comfort and healthy indoor environments with minimal energy use. Offering long-term savings, Passivhaus is the affordable solution for all those looking to build. Keep an eye out for new listings on this page to discover which schemes will be opening up their doors near you! Are you involved in or occupy a Passivhaus and proud? Get involved in an international event that is all about sharing Passivhaus experiences and knowledge. The next International Passivhaus Open Days will take place from 8-10 November 2019. Projects can be at various stages - from fully occupied to under construction. 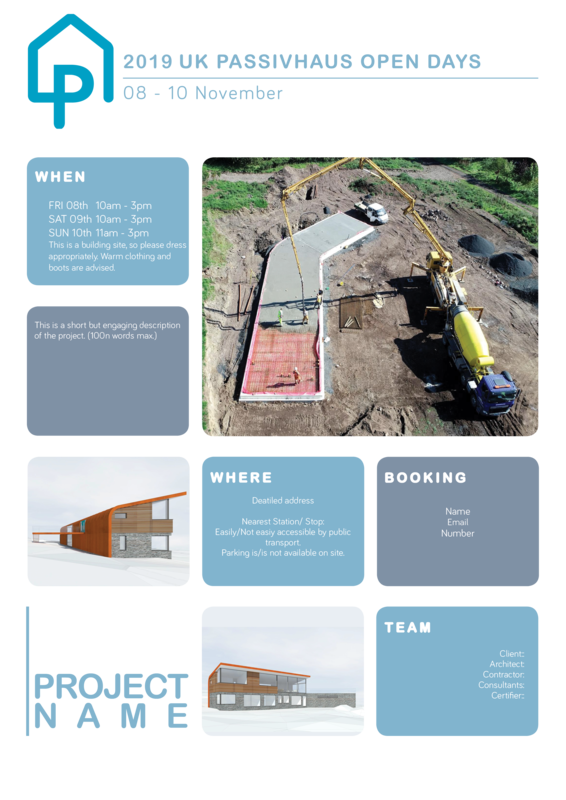 Spread the word and offer others the chance to experience the benefits of Passivhaus first hand. To participate in the International Passive House Open Days, please register your project with the International Passive House Database. If your project already registered with the Passive House Database, simply fill out the information on the Passive House Days viewing appointments and update your contact data if necessary. Registration is free of charge but first-time users will be asked to create an account. Click here for detailed registration instructions. Should you have any further questions regarding registration, please contact info@passivehouse-international.org. If you prefer not to list your scheme on the international database, please complete and return the following form, along with 3-5 high res project images and the Trust will create a booking page following the template pictured opposite.